Getting out of seriously in-grained habits is something quite tough to achieve, so when the 7 Weeks app (free version) appeared in a list of 'Similar' apps during a system re-installation, I thought I would give it a shot; the justification for which was if I can start some good habits, I could work up sensibly to taking part in Be Gung Ho later this year. This was nothing to do with the app at all, more the fact that the first hurdle was getting into the habit of using the app in the first place. It may sound like it doesn't bode well for a habit-forming app to not get used but, in reality, any change in habit has to come from the person themselves; if you don't really want to change, or are not motivated to, then there is nothing in this world which can make you. So, after two weeks of ignoring the nice, clean little logo on my screen, I decided to sign up for my first habit. Now, I tend to be a bit of a headline reader rather than full articles (the internet has way too much information to get through), so I am aware of the "baby steps", "start small" and "KISS" principles, which fit perfectly with the desire to not tie myself into anything major - failing number 2 on my part. 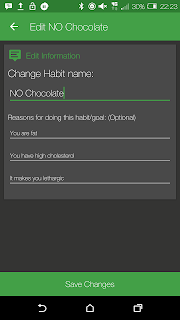 On that basis, I opted to make the first habit one that I knew would be relatively easy to achieve, as I have already achieved it before: No chocolate. Okay, it may seem a bit drastic to cut something out completely since small amounts can allegedly have benefits, but I am something of an all-or-nothing person; once I have a taste for something, I have a compulsion to consume until it has all gone, so it is important I cut it off completely, otherwise it becomes comfort food. I can't understand these weird people who manage to only have a single square of chocolate each day! With my first habit set, it seemed weird to leave the app immediately and go off to do something else, so I had a play around with the settings, which provide for some basic interface tweaks (date format, theme, colour scheme), as well as to set up morning and evening reminders to complete the habit diary. All pretty straightforward, plus there are options for reporting bugs and getting involved with app improvements. So, how have I been getting on? Well, the screenshot below should give an idea! For the first couple of days, I kept on top of the reminders and crossed off each day I successfully went without chocolate, but then things started to slip and I found myself crossing off a couple of days at a time, which now seems to have built up to a whole week. But what of the habit? Did I fall at the second hurdle? Are Cadbury enjoying the tinkling sound of coffers being filled from my emptying pockets? And neither are Nestle, Mars, Lindt (damn!) and their like. 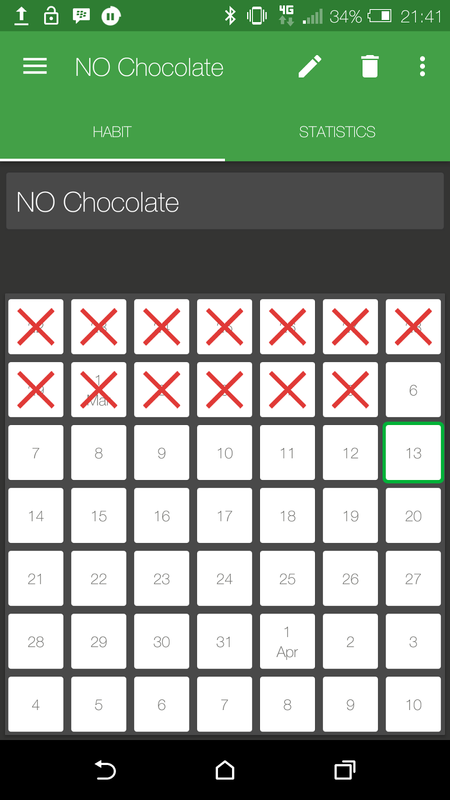 I may have stopped logging chocolate-free days in the app but it hasn't stopped me being aware of how long I have successfully managed my chocolate binging. 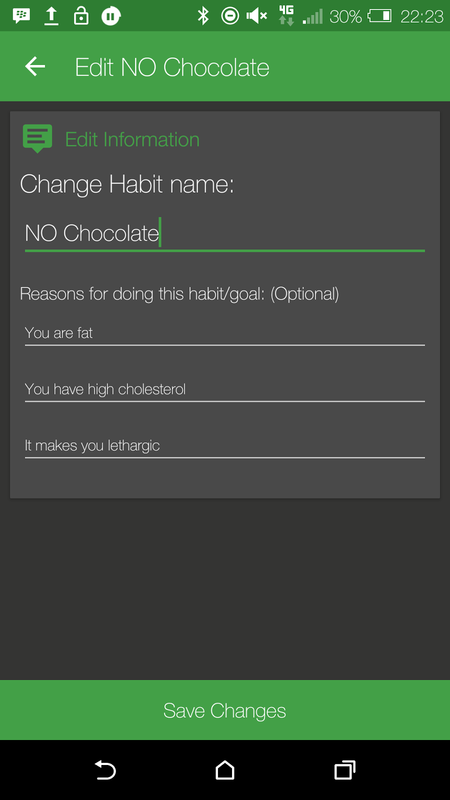 Okay, cake and biscuit consumption has increased, but chocolate consumption has gone! So, did the app work? In a roundabout way, it has, insofar as the act of logging the habit has made it a real goal instead of just an idea in my head. 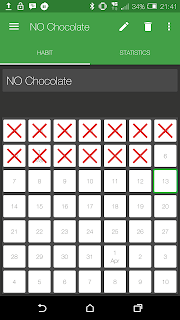 Coupled with the desire to have clean rows of 'X' marks the success-spot in the calendar, it has helped me to steer clear of the chocolate bars and sweets, even if I have yet to replace these with healthier fruit and veg options. Let's be realistic here. There is only a certain amount an app can do. In this case, you can only truly associate your success with the number of 'X' marks in the calendar, but I think there are things the developer could add, such as identifying triggers for a habit. In the case of my first habit, I did not associate it with a trigger - possibly because the only trigger I needed was to see a chocolate bar that needed unwrapping - so it is potentially easier to just say no when something is not an automatic reaction. The addition of trigger identification, even if only optional, should help the user to focus on something more specific than the equivalent of a new year's resolution. Yes, you could add the trigger to the list of reasons, but the very word 'reasons' tends to lead to a subjective response, whereas a trigger is a specific event or action which can be identified. Also, the rewards for successfully building a habit could be more gamified, perhaps generating stickers, grades, success levels or similar concepts to help a person achieve their goal, in much the same way as happens for gamers; maybe even going to the extent of removing rewards for failed goals, as you would with a child to ensure good behaviour. How about connecting with friends and cheering each other on, as with the FitBit and Endomondo apps, and their ilk? Or enabling users to feed back into the system with hints and tips on how to achieve goals, or what setbacks they had? There is so much scope for this app and I am looking forward to seeing how it develops, so with the success of my first habit very nearly tucked under my belt - even if my waistline isn't - perhaps I should target something a little more serious for my next habit, such as building up a running schedule, making use of the gym membership and/or cutting out cakes and biscuits.